We all love sushi, but have you ever wondered what some of the small details on your table are? While you’re busy trying to figure out how to work those pesky chopsticks, it’s pretty easy to ignore the stuff that you don’t use. The following tips will have you impressing the sushi chef in no time. 1. Maki, nigiri and sashimi—what’s the difference? The three are often confused for each another. Maki is sushi in the form of a roll, like the California roll and spicy tuna roll you are guaranteed to find at almost any sushi restaurant. Nigiri on the other hand, is rice on the bottom and slices of fish on the top. There’s usually a small amount of wasabi in between the rice and fish. Lastly, sashimi are pieces of fish alone. Sashimi does not include rice. Don’t abuse the chopsticks. Unless you are eating nigiri, chopsticks are not necessary. For maki rolls, it is customary in Japan to simply use your fingers. If you are using chopsticks, the skinny ends should be touching the food. When you’re done, rest them on the soy sauce bowl. What’s the point of that ball of stuff that looks like lunch meat anyway? 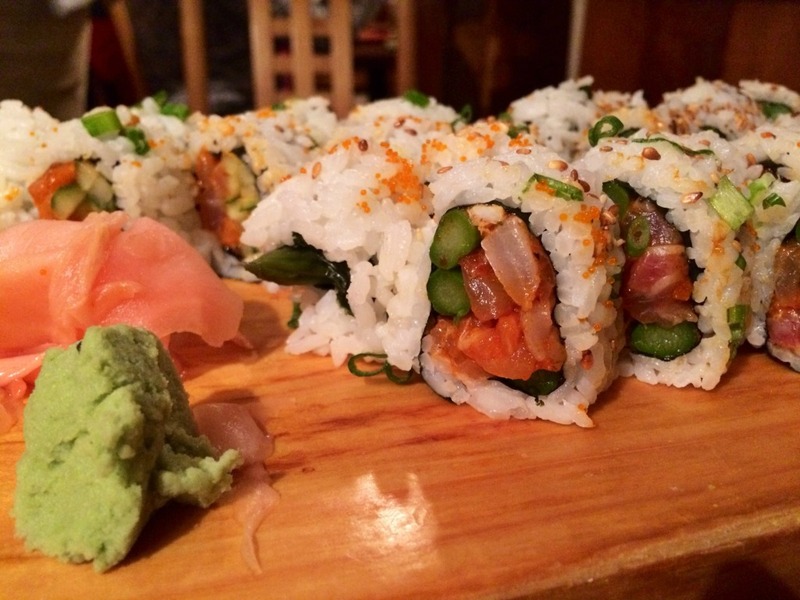 First and foremost, it does not belong on your maki or nigiri. Ginger is there to clean your palate only. Just take a little bit in between pieces of sushi. Many people also mix the wasabi and soy sauce together in the dish provided. This should be avoided, but if you have to here’s how. Wasabi is used for nigiri. Put a small amount directly onto the sushi piece. 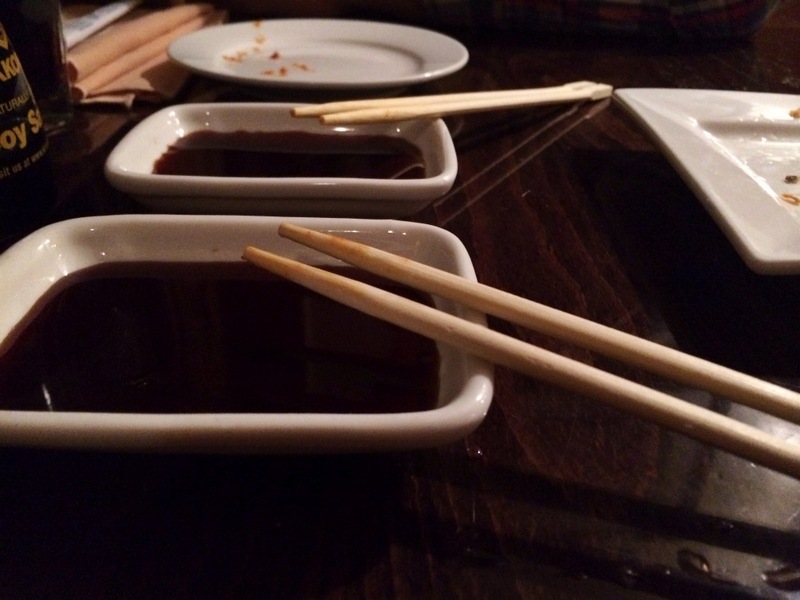 Too much soy sauce takes away from the flavor of the sushi. When dipping your nigiri into the soy sauce, dip the fish side into it instead of the rice side for just the right amount. Avoid shaking excess sauce off. 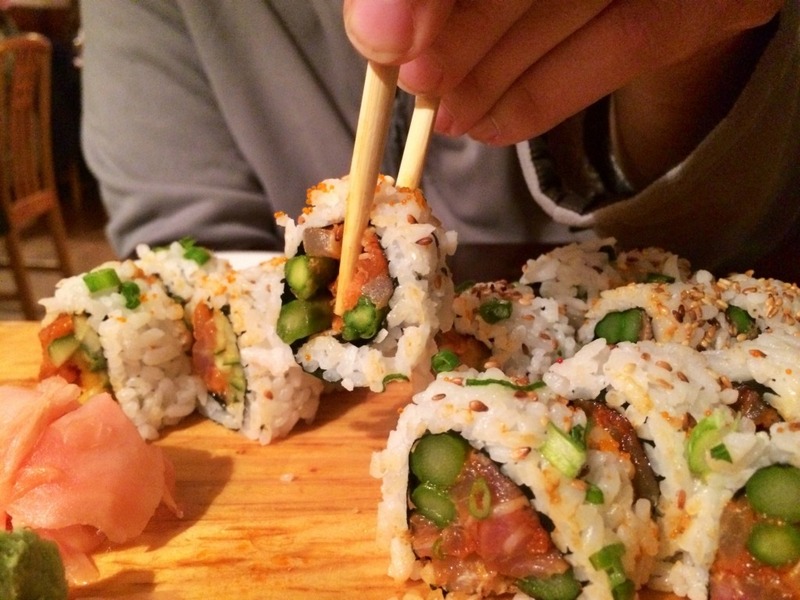 The best way to look like you know what you’re doing is to eat your entire sushi piece at once. It is bad form to take a bite and put the rest back onto your plate. Of course, some rolls can be tricky, with shrimp tails and spicy mayo coming from all directions. If need be, take multiple bites. Just don’t put your sushi back onto the plate in between your munches. Now that you’re prepped with some sushi basics go forth and eat. Sayonara!